It doesn't take Hollywood long to snap up a good idea when it finds one. Only a few days ago The Daily Beast published “How an Ex-Cop Rigged McDonald’s Monopoly Game and Stole Millions,” a title that is pretty self-explanatory. 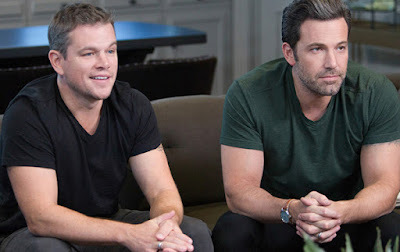 A hot bidding war erupted to win the film rights to the real-life crime story, and the project has landed at Fox where Ben Affleck and Matt Damon are going to bring it to the screen. Affleck will direct Matt Damon in the film, which will have a script by Deadpool writers Rhett Reese and Paul Wernick. Damn. The incredible story follows an ex-cop who allegedly stole $24M by riggin the McDonald's Monopoly game, the one where you get game pieces for purchases. He would then share the winnings with an unsavory group of criminal co-conspirators. The FBI caught wind of the operation through "a tip about an “Uncle Jerry,” who’d sell stolen game pieces. Solid detective work unearthed Jerry Jacobson, a head of security for a Los Angeles company responsible for generating the game pieces. It led to a wide conspiracy that involved mobsters, psychic, strip-club owners, drug traffickers and a family of Mormons who falsely claimed to have won more than $24 million in cash and prizes."